Today’s post doesn’t deal with a street, forgive me. It’s the seventh anniversary of Discovering Buffalo, One Street at a Time! This blog started as a research project for me to find out how Keppel Street got its name since that’s my last name. Seven years ago this week, I began researching in earnest and I realized I was learning all these cool stories. By the first week in July, the blog posts started. In honor of the anniversary, I have decided to write about the woman who came 75 years before me, as the Original Buffalo Streets Girl, H. Katherine Smith. She has basically become my new favorite Buffalo Gal! Helen Katherine Smith was born in Wilkes-Barre, Pennsylvania. She went professionally by H. Katherine Smith and was known as Kate to her friends. Miss Smith’s paternal grandfather was director and general manager of the original Gas Company in Wilkes-Barre and her maternal grandfather was a founder and director of the Wilkes-Barre Deposit and Savings Bank. The family noted that Miss Smith got her business sense and drive from her grandfathers and that if she ever got tired of writing, she’d have made a wonderful business executive. Miss Smith’s first writing was to write rhymes for greeting cards, which she would sell with her father’s help as a young girl, for 25 cents a card. Miss Smith was hired by the Buffalo Courier-Express in June of 1928. She had just graduated Phi Beta Kappa from Vassar College with a degree in journalism. Her most well known Sunday column was titled “Buffalo’s Good Listener”, a series that began in 1936. Published on Sunday’s, her articles were considered to be as important to Buffalonians as going to church. Other columns written by her were “Men You Ought to Know”, “Women of Achievement” and “Who’s Retired”. Miss Smith also wrote a series of articles where she interviewed the descendents of families for whom Buffalo’s streets were named. These are one of the sources that I use as the first step of my research for this blog. This website is literally indebted to Miss Smith…if I hadn’t been referred to her articles seven years ago by the Research Librarian at the Buffalo History Museum (Cynthia Van Ness), none of what I’ve accomplished so far would have been possible. I like to think MIss Smith would be proud of the silly Buffalo Gal who found inspiration in her articles, seventy-five to eighty years after they were written. She was about my age when she was writing them too! Miss Smith’s biggest accomplishment – she did it all while blind. She had been inspired by a journalism professor and decided that she wanted a newspaper job. After she graduated, she and her widowed mother had planned to travel from city to city to find a way to make it happen. Her father had passed away in 1913. Their first stop, five days after graduation, was in Buffalo and she got the job. Unknown to Miss Smith at the time, the same day she met with Courier Editor, the newspaper had run an editorial about her accomplishment of graduation with honors despite her blindness, commending her courage and success despite her obstacles and wished her luck in all her endeavors. She arrived in the editor’s office later that day and was hired. She found a niche at the Courier Express and produced many, many articles. By the end of her first nine years, she had already conducted more than 1,000 interviews. She worked with the Courier-Express for more than 48 years, until her retirement in 1976, when she moved to Florida. In all the interviews she did over the years, she said “men are often easier to interview than women, for they are more certain of what they want to tell you, while women have a better memory for picturesque details”. Most of her articles revolved around her interviews with people, in Western New York and beyond. She traveled to Hollywood, Europe, and South America. In her travels, she flew in a glider, floated down a river in Ecuador on a balsa raft, and raced across Lake Erie on an experimental hydro-skimmer. She covered press conferences in Washington, DC, during the presidency of Franklin Delano Roosevelt. In 1936, she covered South America and preparations for the Pan-American Peace Conference in Buenos Aires that fall. She sailed from New York and visited universities at Santiago, Chile, Lima, Peru, and Quito, Ecuador. She took two years of Spanish in college, and studied with a private tutor and became competent in Spanish. At the start of World War II, the President of Peru was in Buffalo for a press conference. All of the press were provided with the same summary sheet. Because of her Spanish skills, she was able to quickly ask him about Peru’s efforts to help the US War Effort while he shook all the reporters’ hands. She was the only reporter with the scoop because she was the only reporter to understand his response (in Spanish). In addition to her Spanish language skills, she minored in French in college and was an active member of the French Club of Buffalo. Miss Smith lived in a second floor flat with her dog and her mother. Each day, one of her five volunteers would read her the local papers, which she would use to gather ideas for articles about personalities around the region. Many of her leads came from friends or readers. Often, the people she would interview would come to her home, otherwise, she would have someone drive her to their house or office. Her mother would often accompany her to the interviews, as a silent partner, reading silently while Miss Smith did her work. Sometimes, before the interview began, her mom would whisper to her details of the room that could serve as a lead in a story – for example, a picture of Lincoln over the fireplace or a stamp collection on the desk. Her mother would often read aloud for entertainment at home, as at the time, less than 1 percent of books were available in Braille and books on tape did not yet exist. All of Miss Smith’s notes were taken in braille, which she learned at age 4, when she started kindergarten. The teacher herself taught herself braille and used the method to teach her. She had a private teacher for five years and then attended the Wilkes-Barre Institute before she attended Vassar. In 1969, she bought a tape recorder to help use during interviews when there were technical terms she was unfamiliar with. She always preferred not to use the tape recorder. After she’d type her story on her braille typewriter, she’d have someone read it to her for corrections before it was mailed in to the newsletter. Editors noted that her work was typically free from typographical errors. She was active outside of her journalism work. She swam every morning at the Buffalo Athletic Club. She played bridge and may have been the only player to compete in championship tournaments while openly using marked cards. She won at least two tournaments in the Niagara Frontier. She had been a Camp Fire Girl and was awarded the Women of Achievement Medal from the Camp Fire Girls in 1939. She was in demand as a speaker for many women’s and civic groups. One of her most popular presentations was titled “Adventures in Newspaper Writing”. I’ve really been inspired by Miss Smith’s story lately. I have had some difficulties with a condition called uveitis, which has led to a few bouts of temporary blindness. I am currently in one of those flares right now. It’s been a struggle, but I think to the example of Kate and everything she accomplished, and the prospect of my issues becoming permanent don’t seem quite as scary. It tends to put a damper in my ability to write for this blog at times, because so much of my research is done reading old books and microfilm, which aren’t exactly optimized for the visually impaired. It’s tough, but I know I’ll get through this. In an interview after her retirement, Miss Smith said her favorite food was Italian eggplant (eggplant parmesan). She enjoyed cooking, but she didn’t like to bread the eggplant, because it’s too much work. A newspaper in Florida published her recipe for Italian eggplant, and I intend to add it to my repertoire. As those who know me know, eggplant parm is my favorite meal and a staple of my diet. I often will buy three eggplant at the farmer’s market and spend the afternoon breading them all at once and freeze the slices, because I also hate breading it too! I like to think Miss Smith and I would have been good friends. I can’t wait to sit around and chat with her in the great hereafter….imagine the two of us as a tag-team of interviewers! We’d be able to write-up some interesting stories for sure. I still can’t believe I’ve been writing here on this blog for seven years! We’re a growing group of Buffalo History fans. Thank you, thank you, thank you to every single one of you. It makes me so happy to share these stories and to hear your stories in return. I wish I could have a get together with all 6,800 of you and talk about history and Buffalo and everything else. Thank you to everyone who has read my posts or come to any of my lectures. Please continue to share my posts with your friends, because the more the merrier. I love writing these posts and I hope you all have gotten something from them too. In addition to my regular streets presentations, I have a new presentation that I’ve been giving called “Which Side of the Skyway Do You Stand On?” about the history of the skyway; please contact me if you’re interested in having me give a presentation to your group. I also have plans down the road to create a downtown walking tour to mesh together my love of history with my career as an urban planner. So stay tuned, there’s always more to come. We have covered close to 175 street names in the past seven years! We’ve got a lot more yet to come! Want to start back at the beginning? Check out the street index to read all of the entries. And again, from the bottom of my heart, thank you! Ritz, Joseph. “The Good Listener: Chatty for 33 Years” The Braille Monitor. January 1970. Inkprint Edition. National Federation of the Blind, Berkeley California..
“Intrepid Reporter” The Key Reporter: The Phi Beta Kappa News Magazine. Summer 1936. Published by the United Chapters. “Journalism A Career of Rewards”. Palm Beach Post. Feb 22, 1980. Camp Fire Girls of Buffalo and Erie County , “Camp Fire Girls Women of Achievement Project, Helen Katherine Smith, 1939,” Digital Collections – University at Buffalo Libraries, accessed June 1, 2018, https://ubdigit.buffalo.edu/items/show/55927. “Katherine Smith, Blind Journalist, Great Personage”. The Post, Ellicottville NY July 18, 1934. Lyon, Jean. “A Newspaper Feature Writer Takes Notes in Braille” Perkins School for the Blind Bound Clippings: Occupations, 1908-1937. Winn, Marcia. “Buffalo Woman Tells of Her Work Here”. Perkins School for the Blind Bound Clippings: Occupations, 1908-1937. Doyle Avenue is a street in the Riverside Neighborhood in Buffalo. 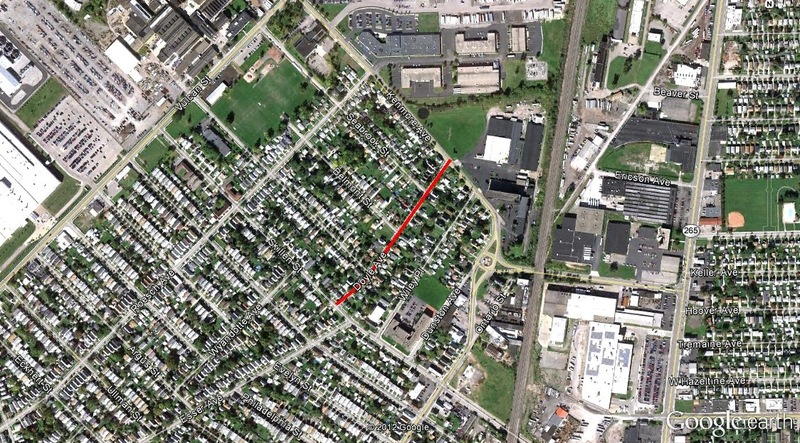 The street runs 0.25 miles between Kenmore Avenue and Skillen Street. Doyle Avenue is named for Major General Peter Cozzens Doyle. Maj. Doyle was born in Washington County in 1842. He came to Buffalo with his family via the Erie Canal when he was 4. He lived in Buffalo until his death. He attended Public School No. 2 and Old Central High School, but his formal education ended in his teens as was custom in the time, due to the need to earn a living. He became a telegrapher and became an operator for the Lake Shore Railroad before he was 16. At 16, he became a bookkeeper for the Buffalo Courier, and worked for the paper from 1858 until the outbreak of the Civil War. He enlisted and became a lieutenant. His knowledge of telegraphy was valuable to the army signal corps. Following the war, he returned to the Courier. He was associated with the railroads and local wholesale grocers. Maj. Doyle was elected to his first public office in 1869, when he was elected superintendent of the Buffalo Fire Department. At the time, firemen were all volunteers, and Superintendent Doyle was a pioneer in advocating the use of horses to draw hose carts and hook and ladder apparatus. At the time, volunteer firemen and any other men or boys who were nearby would hitch up to the apparatus and run to the scene of action. In 1870, Doyle became Chief of Police. During this time, he purchased the right of way for the Buffalo and Jamestown Railroad. He would drive his buggy along the right of way and buy the land, parcel by parcel. He became first superintendent of that railroad. In 1881, Doyle was chairman of the Democratic Committee of Erie County. That year, they were having a hard time finding a candidate for Mayor, as many democratic candidates had been defeated in previous elections and they found running to be a hopeless cause. Five people had been asked to run for office, all turning down the offer. Doyle was instrumental in convincing prominent Buffalo attorney and former Erie County Sheriff Grover Cleveland to run for Mayor. The rest is political history, as Cleveland rose from Mayor to Governor to President by 1885. 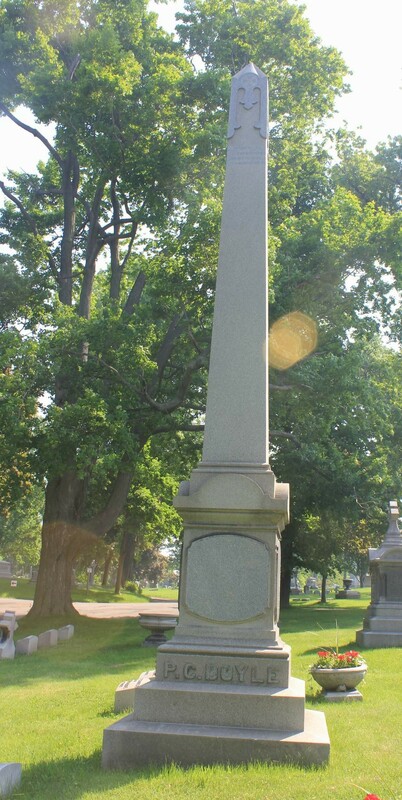 Maj. Doyle was also the Buffalo representative for the Lehigh Valley Railroad and Coal Company, president of the Local Merchants Exchange and a vestryman of Trinity Episcopal Church. Maj. Doyle married Annie Kelderhouse (her uncle William Mowry operated the first cotton mill in New YorK State). Annie and Peter built a brick home at Niagara and Georgia Streets. Later, they built another house on Mariner Street. Although he owned a great deal of real estate throughout the City, he owned no land near what would eventually became Doyle Avenue. However, his brother-in-law, John Kelderhouse owned land in that area, which was instrumental in the choice of the name Doyle Avenue. Maj. Doyle and his wife had three daughters and two sons. Sadly, the sons died of diphtheria in their teens, only a year before the discovery of the antitoxin. During the Spanish-American War Maj. Doyle commanded the troops at Peeksill. At the war’s close in 1901, he was made Major General. He died later that same year and is buried in Forest Lawn. To learn about other streets in Buffalo, check out the Street Index.